This draft European Standard is submitted to CEN members for formal vote. It has been drawn up by the Technical Committee CEN/TC 250. CEN members are the national standards bodies of Austria, Belgium, Czech Republic, Denmark, Finland, France, Germany, Greece, Hungary, Iceland, Ireland, Italy, Luxembourg, Malta, Netherlands, Norway, Portugal, Slovakia, Spain, Sweden, Switzerland and United Kingdom. © 2003 CEN All rights of exploitation in any form and by any means reserved worldwide for CEN national Members. This document (prEN 1993-1-8: 2003) has been prepared by Technical Committee CEN/TC 250 "Structural Eurocodes", the secretariat of which is held be BSI. This document will supersede ENV 1993-1-1. This standard gives alternative procedures, values and recommendations with notes indicating where national choices may have to be made. The National Standard implementing EN 1993-1-8 should have a National Annex containing all Nationally Determined Parameters for the design of steel structures to be constructed in the relevant country. 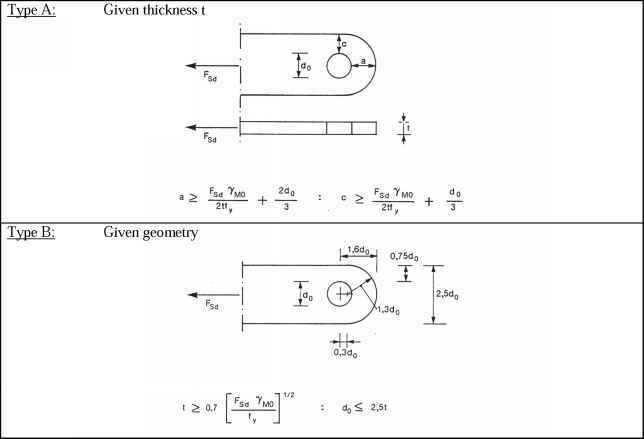 (1) This part of EN 1993 gives design methods for the design of joints subject to predominantly static loading using steel grades S235, S275, S355 and S460. (1) The rules in EN 1990 clause 1.4 apply. - basic component (of a joint): Part of a joint that makes a contribution to one or more of its structural properties. - connection: Location at which two or more elements meet. For design purposes it is the assembly of the basic components required to represent the behaviour during the transfer of the relevant internal forces and moments at the connection. - connected member: Any member that is joined to a supporting member or element. - joint: Zone where two or more members are interconnected. For design purposes it is the assembly of all the basic components required to represent the behaviour during the transfer of the relevant internal forces and moments between the connected members. A beam-to-column joint consists of a web panel and either one connection (single sided joint configuration) or two connections (double sided joint configuration), see Figure 1.1. - joint configuration: Type or layout of the joint or joints in a zone within which the axes of two or more inter-connected members intersect, see Figure 1.2. - rotational capacity: The angle through which the joint can rotate without failing. - rotational stiffness: The moment required to produce unit rotation in a joint. - structural properties (of a joint): Resistance to internal forces and moments in the connected members, rotational stiffness and rotation capacity. - uniplanar joint: In a lattice structure a uniplanar joint connects members that are situated in a single plane.